I had wanted to get this acetone-free nail polish remover for the longest time after having tried it two years ago. I kept putting off purchasing it as I couldn’t justify paying €19.95 for a 150ml bottle. Yes, for that price, your Purifying Polish Remover would come in a sleek and sturdy signature black KOH box. That’s nice to have but let’s face it, it’s unnecessary. To put things into context, I hesitate paying almost €20 for a nail polish remover because, at the local drugstores, I can get a decent acetone-free one from brands like Essence and Etos for no more than €2 for the same volume. Of course, these do not have the same formula as KOH’s but they were good enough to do the job. offering the Purifying Polish Remover at a discount. It lowered the price to, lo and behold, €9.95. You get the same bottle but this time, it’s in an organza bag. It’s still on the expensive side (compared to the alternatives) but it’s basically half the original price. Plus, I think the organza bag is much more practical to have than the box. So, I finally went ahead and made the purchase. The special composition of KOH Purifying Polish Remover with Vitamin E ensures that nails are quickly and thoroughly cleaned and degreased. The added Castor Oil and Almond Oil helps KOH Purifying Polish Remover to improve the resilience of the nails. This delicately scented remover contains no acetone and doesn’t dry out your nails. 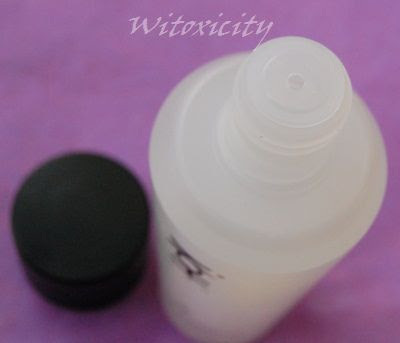 The remover is also very suitable for cleaning artificial nails. Methyl Acetate, Propylene Glycol Methyl Ether, Aqua, Ricinnus Communis, Tocopherol Acetate, Prunus Dulcis, Styrene Copolymer, Sodium Lauryl Ether, Benzyl Salicylate, Citronellol, d-Limonen, Eugenol. Hexyl Cinnamic, Aldehyde, Hydroxycitronellal, Hydroxymethylpentylcyclohexenecarboxaldehyde, Lillal, Linalool, Methyltrimethylcyclohexenyl-butone. It’s a murky white liquid in a plastic bottle with a hole-opening. One of the first things you would notice is the scent. It’s definitely not your run-of-the-mill nail polish remover smell. The smell is, funny enough, pleasant. I could detect a trace of the usual hallucination-inducing nail polish remover smell but KOH must have pumped in a great deal of fragrance to mask it. The scent is a bit sweet and floral and if anything, I think it has the same fragrance as the range of KOH Body Sensations products, like the KOH Shower Foam Sensation. I’m tempted to say, “A nail polish remover is a nail polish remover is a nail polish remover.” like how I sometimes say of body washes. However, one will notice a difference compared to the usual drugstore fare. Please note: All the nail polish removers that I refer to in this article are acetone-free. • Drier feel – I know we’re talking about a liquid here but I do find the KOH Purifying Polish Remover to have a drier feel. The cotton pad feels less wet with this compared to when I use a conventional remover. With a conventional remover, I can usually manage to remove polish from about three nails with a cotton pad that has been drenched with remover just once (because it’s wetter). With the KOH remover, I can manage only one or two nails. The cotton pad dries faster and I need to keep going back to the bottle. The removal process takes a bit longer, so if I’m in a hurry, I prefer to use a conventional remover. • 'Oily' feel – As you would have read in KOH’s description of this remover, it contains Castor Oil and Almond Oil. The nails, cuticles and fingers do end up with a kind of ‘oily’ feel, or perhaps a better way of putting it would be that the nails, cuticles and fingers feel less dry/dehydrated after the whole exercise. Conventional removers make my nails and cuticles very dry. So, I make it a point to apply a cuticle balm or a rich natural moisturiser on my nails and cuticles immediately after. I do the same after using the KOH remover but it’s less urgent. It’s worth mentioning that you don’t exactly end up with oily nails and cuticles. It does do its job of prepping and degreasing the nails, which means that you can start applying polish on your nails after using this KOH remover. • Scent – Oiii, you do end up with nice smelling nails when you’re done removing polish with this remover and the scent stays on for several hours. It’s an all-round polish remover, no different from the conventional removers. So, it also works fine with polishes with glitter and flakies. 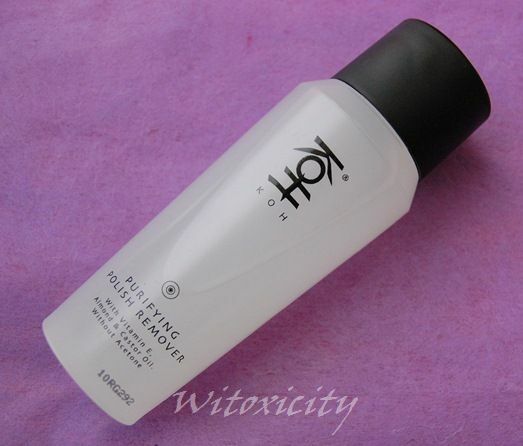 I once got a free mini (20ml) sample of this Purifying Polish Remover with my KOH purchase at a parfumerie. I just thought I’d show how cute that little thing looks next to its Big Momma. By the way, I believe the KOH Experience Shop in de Bijenkorf Amsterdam has mini samples of this too......but unfortunately, they are not given free. They are for sale. Apologies, I can’t remember the price – probably a couple of euros. Do I recommend the KOH Purifying Polish Remover? I do, but only if you can get it at the lower price of €9.95. Why pay €19.95 when you can get it for half the price? I've just checked the KOH website. This remover is also available at this special price in its online shop. The KOH online shop ships internationally. Please refer to my Guidelines On Where To Buy KOH Nail Polish post (I'm not an affiliate). For that price, which is just unfathomable in US dollars, I would expect to get MORE use out of it than a regular remover. With acetone I can remove polish from my whole hand with one cotton ball. MAYBE applying remover twice, but not usually. So, this is definitely not worth it to me! Even if I have been wondering about "safer" removers. Great review! Great review my dear. 50% off is a good deal, € 19,95 is way too much for a remover, € 9,95 sounds more reasonable. I love the packaging and it sounds nice. Thanks so much, Nicole. €9,95 is still dear but at least, you do get a pretty good and less drying product. I like the packaging too, especially the bottle design. I also use acetone-free remover and this one sounds delightful, but it doesn't come cheap.